When Stephen does the grocery shopping, I know I'm in for a surprise. He likes to find at least one produce item that we don't normally purchase to spice things up a bit. Last week, it was cherry peppers. 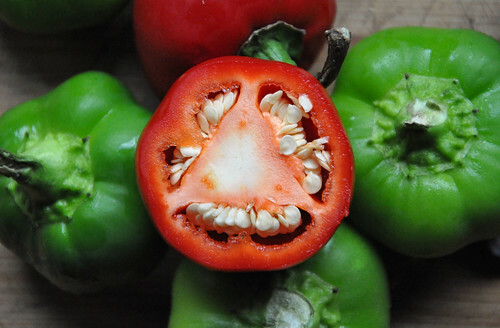 When I returned home from work that day, he was all excited about making cherry pepper poppers . . . he could hardly contain himself! We didn't totally know what to put in them, so we improvised. We had some leftover Tzatziki, cheddar cheese, whole wheat breadcrumbs, brown mustard, and cayenne pepper. Seemed like just enough to mix together a satisfying filling. 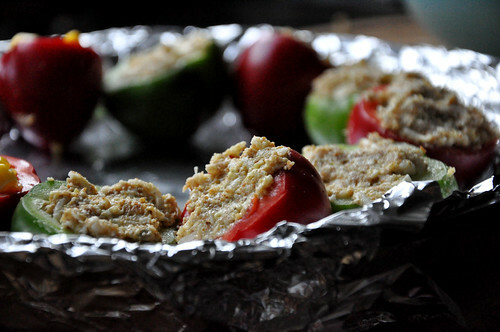 Preheat your oven to 400 degrees F. Line a small baking dish with aluminum foil. 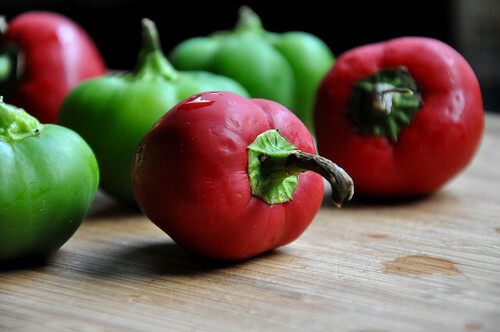 Cut the tops off the cherry peppers and scoop out the insides, including the seeds. 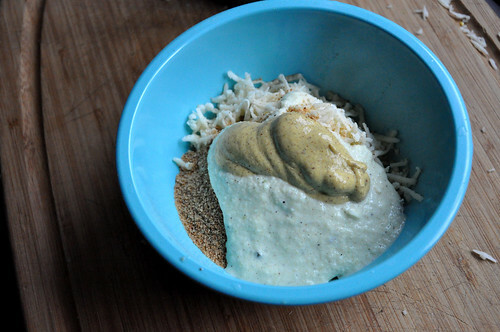 Mix together the tzatziki, cheese, breadcrumbs, mustard, and pepper. 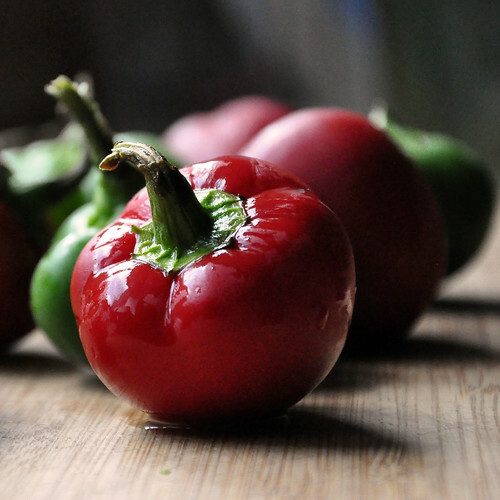 You may need more or less of this filling depending on the size of your peppers. Just stick with the equal parts measurements. 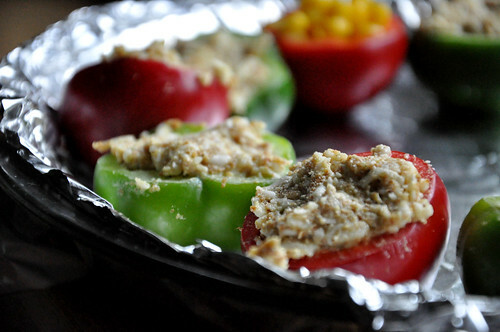 Use a spoon to scoop filling into the peppers. Press filling in to ensure each is filled to the brim. Place them in the baking dish, opened part up. 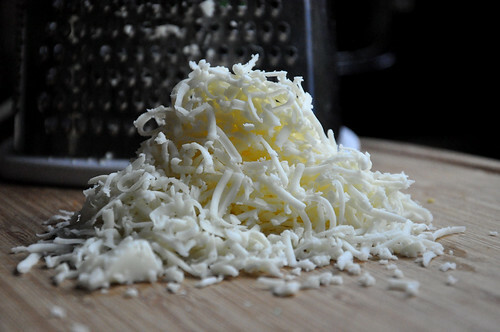 Bake for around 25 to 30 minutes, until cheese is bubbling and pepper is soft. We want to know: Do you stick with the same produce picks each time you visit the grocery store . . . or do you try to mix it up for fun? Us? We used to always get broccoli, green peppers, onions, and white mushrooms. Every time. Now we vary our cart with parsnips, portabellas, purple potatoes, asparagus, etc. We like the variety and how it allows us to cook different dishes. But all that different stuff is good for nutrition, too.